Jypyä Pop (Turku, Finland) on 24 June 2017 in Lifestyle & Culture and Portfolio. 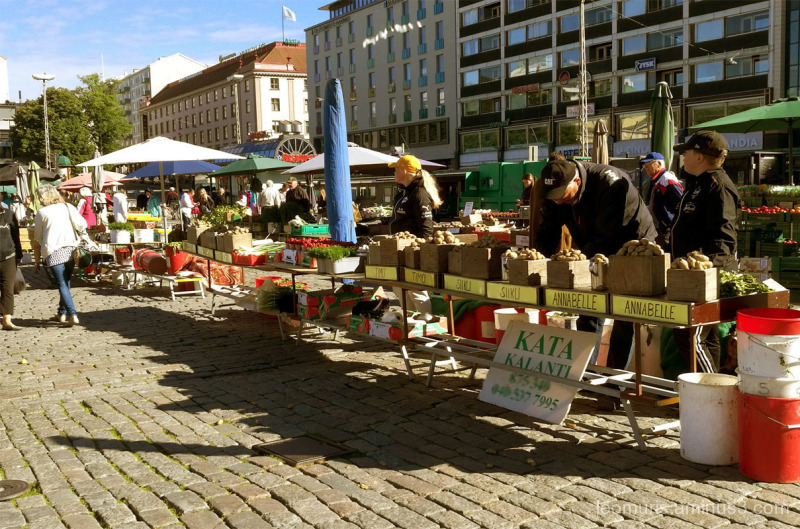 The Turku Market Square is the place to get the freshest vegetables in summer time. The seller in the picture has potatoes. The names of the varieties are at the ends of the boxes. Potatoes have been raised in the field early in the morning and brought directly to the market for sale. Farmers bring tangerines in addition to potatoes and other vegetables, and soon the berry sales time is about to begin when the berries mature. Buy products of proximity (km zero) is the best option, (I think). Have a happy Saturday ! Lovely market scene with fresh vegetables and new potatoes beautifully displayed. Beautiful image of the market . It is very nice to buy fresh vegetables !! Great view of the street market, they are ready for a busy day. @Curly: Thank you. it is true. A beautiful day for a farmer's market. I like seeing all of the fresh food for sale!!! Nice shot of the market. I agree that fresh is best. I love the farmers markets. Nice shot of this one. @B. Thomas: You are right. It is.